Kidderminster Harriers FC was formed in 1886. They were originally an athletics and rugby club. 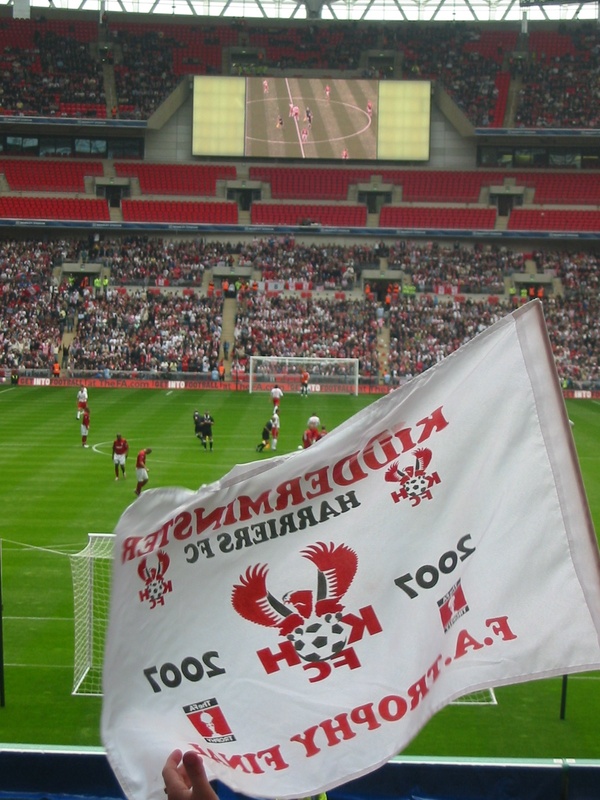 When the Birmingham and district league was formed in 1886 the Harriers became one of the founding twelve members. 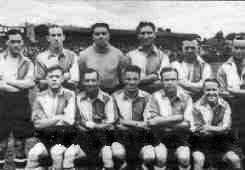 Because it comprised mainly of Football League reserve teams the Harriers first success came in 1938 when they won the championship. In 1939 the Harriers joined the Southern League but the onset of World War II meant they only played two games. After the war the Harriers rejoined but left in 1960 to re-enter the Birmingham League (later to become the West Midlands League). 1970 they again re-joined the Southern League until 1983 when they joined the Alliance Premier League. 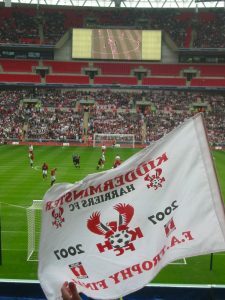 It was during this period that the Harriers grew in stature to become one of the leading clubs in non-league football when they reached the Welsh Cup final on two occasions, losing first to Wrexham and then to Swansea City. In 1987 Kidderminster Harriers reached Wembley for the first time ever for the FA Trophy Final vs Burton Albion, drawing 0-0 at the national stadium and then winning the replay at the Hawthorns 2-1. In 1991 the Final was reached again when they lost 2-1 to Wycombe Wanderers before a, then, record crowd of 34,842. In 1995 they lost by the same score line to Woking. 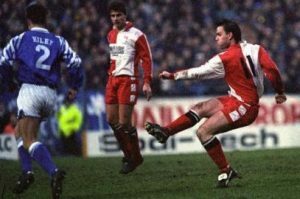 The 1993/94 season was when the Harriers shot to national prominence and acclaim when, in the FA Cup, they performed their first ever giant killing act by beating 1st Division Birmingham City 2-1 at St Andrews and then Preston N.E. 1-0 at Aggborough. They then entertained Premiership side West Ham United in the 5th Round, losing 1-0 in front of a crowd of 8,000. That season saw the Harriers clinching the Vauxhall Conference title for the first time but they were cruelly denied their place in the 3rd Division with the flimsy excuse that Aggborough did not meet the standards? required of the Football League, although many existing grounds already being used in the 3rd Division were nowhere near as good as Aggborough. Ironically, it was during the following close season that construction of a new 1,100 seater stand was completed. The following season the Harriers reached 2nd place in the Conference, after throwing away a fifteen point lead, Macclesfield finished top and took their place in the 3rd Division. Since then fortunes had been mixed and finally in the 1998/99 season the manager, Graham Allner, was dismissed after the feeling that a new face was needed at the helm to lead us into the new millennium. Much to everyone’s surprise the club pushed the boat out and appointed the ex Liverpool and Denmark midfield maestro Jan Molby as our new manager. At first the results were not going our way but with the appointment of the former West Ham and Liverpool midfielder Mike Marsh the team started to gel and the 1999-2000 season culminated with a game near to the end of the season against our nearest opponents Rushden & Diamonds that we won 2-1 in front of a capacity crowd of 6250. Rushden drifted away after that and we won the League by a clear nine points from them to enter the Football League for the first time ever. With the fresh challenge of new teams to play against, and better quality stadiums to play in, it would have been thought that crowds would have increased above our Conference average of 2,500 but that was rarely the case and along with the ITV Digital fiasco the club failed to make their presence felt in the League with our best finish coming in the 2001-02 season when we ended the season in tenth place. Jan Molby left the club at the end of that season for a disastrous spell as the manager of Hull City and KHFC went back to their old ways of appointing from within the club with Ian Britton, the youth team manager, being given the role of first team manager. He lasted just the one season before the club re-appointed Jan Molby for one year and proved that you cannot move forwards by going back. Another youth team man, Shaun Cunnington, was given the job as temporary manager until the arrival of a new full time appointment. That was to be Stuart Watkiss who was a likeable man but he hadn’t got a clue how to manage and we eventually found ourselves back in non league football after just five years of being Big Time Billy’s. Watkiss lasted just a few more months as he struggled to motivate the team in the Conference and he was eventually dismissed to be replaced with the former KHFC captain Mark Yates as our new manager in January 2006. At first Yates struggled but he managed to consolidate the team in the new situation they found themselves in. 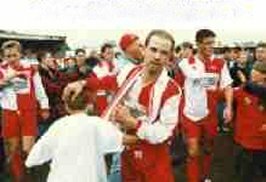 The following season he managed to bring a taste of the glory days back to Aggborough when a fine run in the FA Trophy took us all the way to the newly re-built Wembley Stadium. Over 53,000 followers of both Stevenage Borough and the Harriers became the first fans to see a professional Cup Final in the new national stadium, a week before Man Utd and Chelsea played out yet another boring Premiership FA Cup Final. Sadly despite going into a 2-0 lead at half time, with our goals coming from James Constable, Stevenage went on to overrun us in the second half and were worthy 3-2 winners by the time the final whistle went. You can read a full report of the game here. In January 2010 the Harriers appointed Steve Burr as the new manager following Mark Yates decision to join Cheltenham Town. Burrs arrival bought a whole new outlook to our style of play and in his first season the Harriers just missed the play offs by one place finishing in 6th place for two seasons running and then in his 3rd season we finished in 2nd place behind Mansfield Town but lost out in the play offs to Wrexham 5-3 on aggregate. Political in-fighting within the club eventually saw Steve Burr leave and Gary Whild take over but that signalled the start of our decline. A new regime came into the club headed by Colin Gordon and Rob Brown and the team was dismantled for cheaper options with the obvious results. After struggling at the foot of the table for all of the 2015-16 season the Harriers were relegated to their lowest level in thirty three years and entered the National North League for the 2016-17 season to start again with new management – John Eustace and Matt Gardiner – in charge.